As a follow up to the previous article, it is time to announce a new way of surveying in South Africa with some new and very impressive toys, the DistoX2 and a Nexus 7 tablet with TopoDroid installed on it. We decided to test this combination fully over the last few weeks and see what it is capable of. For this enter a cave named Villa Louisa III. According to its description, it’s a fairly large cave and heavily mined. So at the entrance of the cave we switch on the tablet and create a new file named Villa3. The tablet has GPS, so we immediately get the exact coordinates of the cave entrance and make that spot our first survey station. Now what the DistoX2 is exactly is a laser rangefinder with some upgrades. The laser rangefinder itself can take very accurate distance measurements up to 120 meters away. It also had an inclinometer, but you had to keep the device upright (screen facing upwards) and its angles were limited to +60 or -60 degrees. The first thing the upgrade does is to improve the inclinometer so that the device can be held on its side, or even upside down and still take incline measurements. It also lets you take any angle you want, so a -90 degree shot can even be taken. 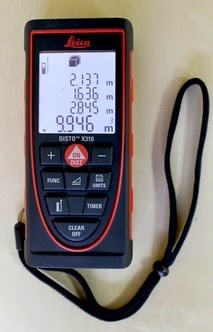 Next the upgrade allows compass direction measurements to be taken. However, some companies have produced laser rangefinders that can do all of the above, they only give you one or two of the measurements at a time. With the DistoX2 one aim and one click gives you all three measurements. Now normally you would need to write down those measurements, but that is where the next piece of tech comes in, Bluetooth and the tablet with TopoDroid. With a click of a button on the tablet, the information gets downloaded from the DistoX2 to the tablet. No need to write anything down. But there is another piece of the upgrade package. It allows you to store many shots taken. So at a survey station you could take your left, right, up, down shots and the shot to your next survey station and then with a click of a button transfer the shots to the tablet and have all five shots there in a matter of seconds. Why stop there? With the ability to take shots quickly and easily and download them easily we took many shots. We averaged at 50 shots per survey station! Probably too much, but then we wanted to test the equipment fully. You can easily do a shot every 2 or 3 seconds and it takes about half a second per shot to download. So 50 shots will take you 3 minutes to take and transfer to the tablet. Now why would anyone want 50 shots at one survey station? Detail. Especially in a chamber where the walls are very irregular. Or where the roof is irregular and you want to get that exact detail in of how its height changes between the survey stations. So basically what you could ideally do is to take a bunch of shots horizontally around you in order to get good measurements to draw your horizontal survey with. Then get a bunch of shots along the floor and roof of the passage and you have plenty of detail for an elevation survey. Then take shots in a circle from your left upwards and then down to your right and you have plenty of detail for a cross section of the cave passage. But, who wants to do the entire trigonometry involved with 50 survey shots at each station and draw all of these to scale paper? Well, TopoDroid is very good at it. 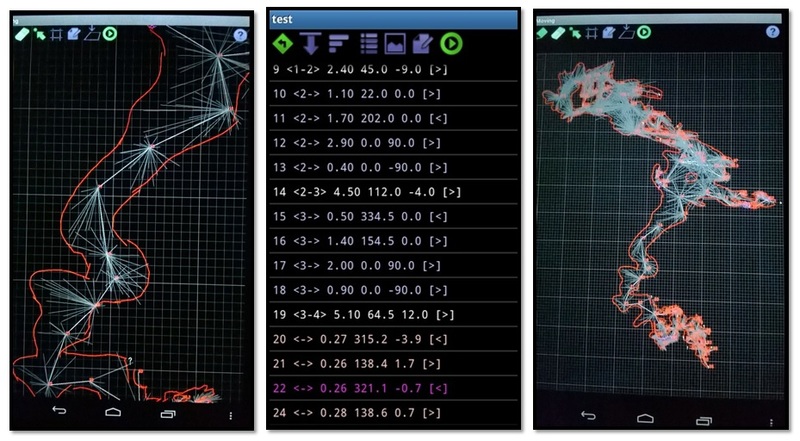 After you have downloaded your 50 shots, with the final shot being to the next survey station, you just tell TopoDroid that the final shot is, let’s say, survey station 1 to 2 and all trig and magnetic declination calculations are done for you and displayed in horizontal and elevation profiles on the tablet. Within minutes right there in the cave you already have the line survey of the cave, calculated to scale and all you can do now is to draw in the walls and features. In the cave you also already have the vertical depth of the cave and the total cave length. In this way we went through almost 100 survey stations and took close to 5000 shots in about 7 hours of surveying. What emerged on that tablet is a sketch with lines everywhere, but so dense that you can exactly draw the walls in along the edges of those lines. When you get back from your long day of caving you can export the information to a computer and now another technology comes into the mix, Therion. The data is transferred to Therion and needs some modification, that takes approximately three minutes and you have a horizontal line survey, vertical line survey, 3D model of all the lines that can be rotated and viewed from any angle and a google earth file that shows you the exact horizontal extent of the cave on google earth. For the final drawing of cave walls, you can use either Therion, which I must admit I still need some practice with, or fall back on the old method of tracing the walls along the outer edges of the lines.